To Sum It Up: Tom Mackee’s family fractured after the death of his uncle, and Tom himself is at a low point. He’s exhausted his friends’ patience after their repeated attempts to help him have been to no avail. His family members don’t have much support to offer him, either, as they’re all dealing with various issues in their own lives. So it’s up to Tom to pull himself together—if that’s what he wants. 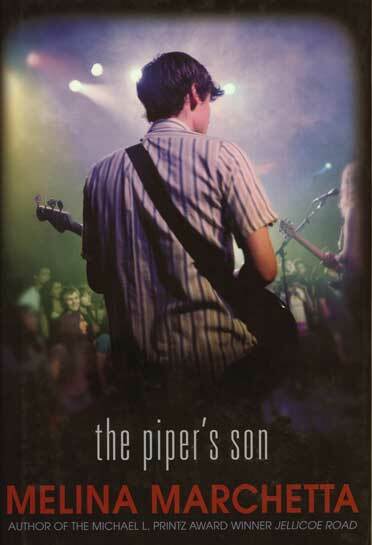 Review: The Piper’s Son is unique in a couple of ways. First, it’s not quite a sequel to Saving Francesca, although characters from the latter make appearances. The Piper’s Son takes place five years after Saving Francesca and focuses not on Francesca Spinelli this time but on one of her friends, Thomas Mackee. Tom is 21, which I suppose technically makes him a few years older than the typical YA protagonist, but then, I think Melina Marchetta’s novels transcend intended audience age groups anyway. Another intriguing aspect of The Piper’s Son is the narration, which occasionally shifts from Tom’s POV to that of his 42-year-old aunt, Georgie (although the entire novel is written in the third person). If you asked me to nearly categorize this book, I couldn’t, and that’s a huge part of what makes it stand out. I will admit to not immediately finding the love for The Piper’s Son that I have for some of Marchetta’s other books, including Saving Francesca. It’s hard to say why, too, other than I just wasn’t feeling it for a while. It’s not that Tom, Georgie, and the rest of the Finch-Mackee clan, whose complicated relationships form the heart of the novel, aren’t compelling. Marchetta digs deep into this family, good and bad times alike, and it’s an intricate, mesmerizing portrait painted with the finest detail. When it comes to breathing life into the characters on a page, Marchetta is in a class by herself. In the end, I think all this book needed was a little patience from me to allow it to tell its story at its own pace. And it turned out to be a powerful story, one that I won’t be forgetting soon, especially since I’ve officially run out of Melina Marchetta books to read. A sad day, indeed. All in All: Another brilliant character study from Melina Marchetta. I found it slightly slow moving compared to Saving Francesca, but the novel’s final impression is well worth any wait. I also highly recommend reading Saving Francesca first to maximize your experience reading The Piper’s Son. I haven't read this one yet, although I do own it. After reading Saving Francesca, I read Jellicoe Road and didn't enjoy it as much, so I was a little afraid to start this one. I probably won't like it as much as Francesca, just because that book is so amazing. But I'm glad to see you still thought very highly of this despite some of the issues with the pace!